A new survey, reportedly taken from a sample of 50,000 smartphone users around the world, reveals the reasons consumers made the phone purchasing decisions they did. 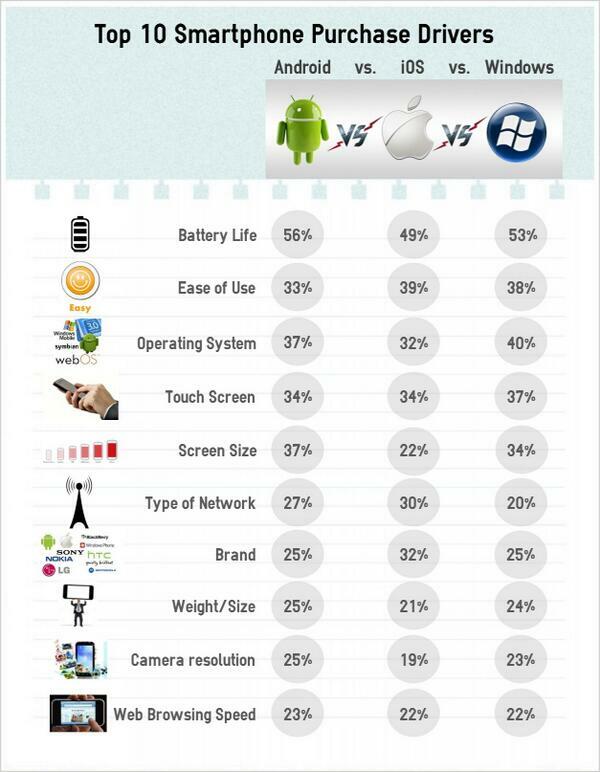 According to IDC’s findings, battery life is the number one most important factor when it comes to choosing a smartphone — coming above ease of use, screen size, camera resolution, and touch screen. When asked, almost half of all iPhone owners quizzed named battery life as the main reason for their selecting the device. After this, ease of use was the most widely given answer for why users had selected the iPhone, followed by the handset’s touch screen. Interestingly iPhone users showed least concern with the quality of their phone’s camera resolution — despite the fact that many of us now use the smartphone as our primary camera. Another potentially revealing take-home is that the importance of screen size was the biggest difference between iPhone, Android and Windows Phone owners — with just 22% of iPhone owners listing it as their main priority, compared to 34% and 37% for Android and Windows Phone owners respectively. Likely through an oversight on the part of the survey’s organizers, App Store selection is not listed as a factor. As with any survey, don’t take this one as gospel. No iPhone owner I know, for example, would buy the phone based on its battery life (which, try as I might, always requires charging at least twice a day.) Regardless, it’s always fascinating to get a glimpse of why people make the buying decisions they do.